You know it’s not a good day to have to pack up as the sunlight wakes you streaming through the skylight above your bed. Granola chomped and tea slurped. It’s 9am and with the chance of a long drive ahead of us we’d best get a wriggle on. Cupboards emptied and safely stowed away, car packed, tea for the journey brewed. Just less than an hour later and we hitch up. Radio switched on for traffic reports and we’re off. Sally Traffic warns us of hold ups and road works, accidents and breakdowns. We can’t stay, work tomorrow morning. Country lanes from the site prove challenging with a caravan and incoming trucks. Water from the fields has made the roads wet, bit pointless having given the Pursuit a pamper session during the week. Well and truly mud splattered. Pheasants play chicken with the traffic, going on their way miraculously unhurt. 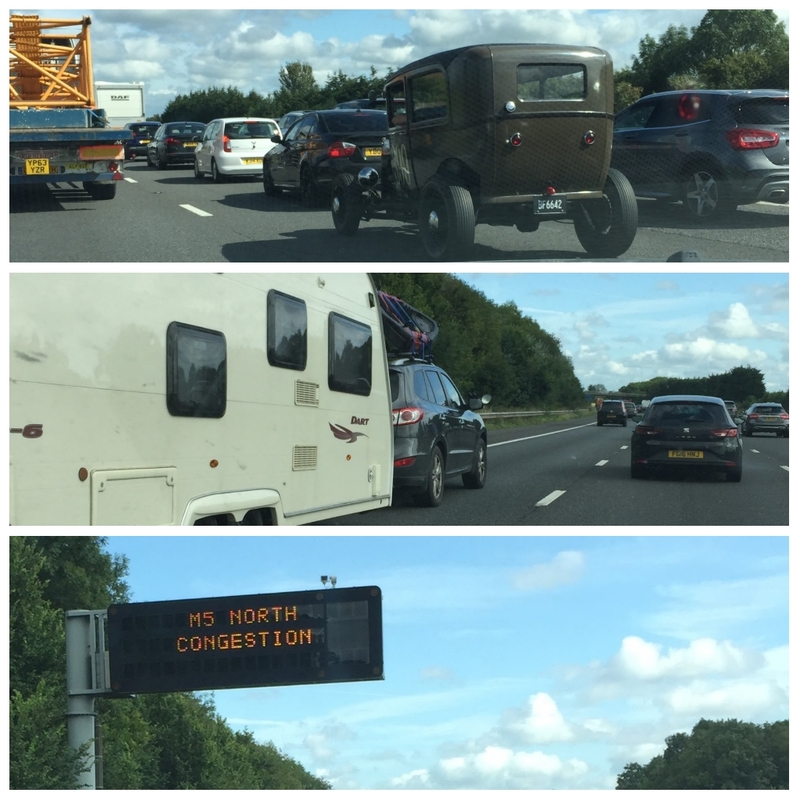 A steady stream of caravans and motorhomes all heading this way and that way accompanied by the roof box brigade. Cars with bikes loaded, others wearing surf boards like the latest fashion accessory. Cars with couples, cars full of wriggling children. Country lanes give way to motorways busy with people heading north, south, east and west. Signs flash telling us that the road is busy, I’m not sure we would have worked that out without the sign. Roadworks slow us down, mandatory speed limits flash above us. Motorbikes noisily weave in and out of slow moving traffic. Cows take themselves to be milked. Caravans low at the front wriggle about ahead of us. Another heading in the opposite direction with their front skylight open. So many travel without wing mirror extensions. Some have blinds open, others have blinds closed. Trying to guess who is going on holiday and who is going home. Can we afford food in the services? No, just a quick wee stop it is then. Motorways morph into dual carriageways which in turn lead to smaller roads. I start to recognise landmarks and roads. A true sign that home is imminent. The end of another lovely few days away. I recognise that last picture and it’s a long way from the M5. Just down in the village from Le Pappilon as I recall from just about a week ago. It was as you described; absolutely sublime. And the cheapest stay of our entire trip! Hans sends his regards! Aw how lovely that you went to visit Hans and Annette. I’m so pleased you liked it as much as we did. We did. Very much. We intended to stay two nights and ended up staying four. Thank you so much for the tip.